Monitoring has become as important as having a phone these days. If you are a rookie on the internet then you especially need to beware of the digital dangers surrounding you. While there are many solutions to take care of your loved ones, they simply fall short when it matters the most. Xnspy has been on the market for some years now and has a burgeoning subscriber base. Here is our review of this app. Xnspy follows all the compatibility standards that are usually limited in other monitoring solutions. For example, it does not require iPhone user to jailbreak the phone before installation or root the Android phone before installing it. The app is regularly updated and its recent update includes support for the latest Android Oreo 8.0 and iOS 11. If you have an older phone you can still use it. It also supports the previous versions of Android and iPhone. In case you want to use it on a jailbreak iPhone, there is a separate version to facilitate the users albeit with a varying set of features. For more information about compatibility, you can visit their website where they have a dedicated section for checking the compatibility of the device. Setting up Xnspy mobile spying app is not as difficult as other monitoring apps. In fact, you just need to follow a set of instructions and the whole process is complete within 10 mins. The app size is small and exceeds no more than 7MB. The app needs physical access to the target phone if it is an Android. In your email, you would receive your account information, download link, and user instructions. Use that download link on the target Android phone and install the app. Later, log into your Xnspy account using the information sent to you earlier and you are ready to monitor! In case of iPhone, you don’t need to install it. Instead, pair the target iPhone with the app and the phone is ready to be monitored. 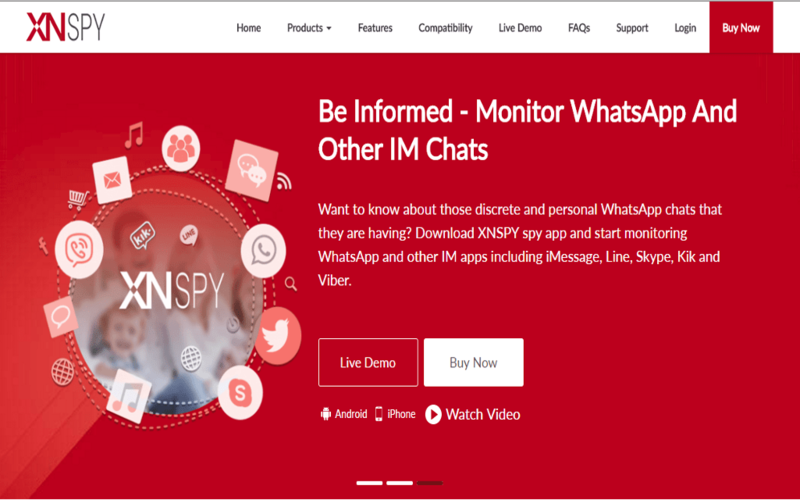 Irrespective of your phone model, you would always start by subscribing the app from its official website www.xnspy.com. Social media monitoring: Xnspy has all the tools to monitor the popular social media platforms. It gives you information in multiple dimensions to analyze their use. For example, besides providing the chats information in the WhatsApp messenger, it gives details about the shared media like pictures, videos, and documents. It also gives information about the incoming and outgoing calls on WhatsApp with their time and contact details. Similar information is also available on Facebook, Viber, Skype etc. Watchlist monitoring: If you do not want to go through loads of information from the target phone, then you can switch to targeted monitoring by using Xnspy’s Watchlist feature. Using this feature, you will only be alerted when specific information in the Watchlist appears on the target phone. For example, if you want to be notified about specific location details, you can enter that location in the Watchlist of mobile spying app. Whenever the target phone will enter or leave that place, you will be notified. The same feature can be availed for Email, contacts, and even words. Remote monitoring: With Xnspy you can access all the information about the monitored device without getting anywhere near it. Its remote control features allow the user to control the device anytime. If you want to listen to the surroundings of the phone without intercepting its calls, you can use the Ambient Recording feature which will record the phone surroundings and upload it to your account. It basically works by accessing the microphone of the targeted phone. When the user enters a command for the surround recording, it starts recording which lasts for thirty minutes. But if you further want to listen, you can give another command. Xnspy Analytics: This is yet another feature that shows the command of the app over the user data. Xnspy has a smart analytics system that records and interprets information for the user through different charts and punch cards. Let’s say you are looking to see a call analysis of the user. You can go to your Xnspy account and choose ‘Analysis’ in Phone Call History Logs. This will open a detailed call history chart based on different metrics. It will first show the top five callers, their contact numbers, and how many times they were called all in descending order. Later, you can see the top five call durations along with their contact numbers. In the end, you will see a punch card displaying the calls made on a particular day at a particular time. This feature is available in its Android version for now and will be introduced later in the iPhone version. Another positive thing about the app is its pricing. The developer has kept the pricing quite simple as compared to other apps of this category. Xnspy has only two packages to offer. Both of them vary on the basis of features and they can be subscribed for monthly, quarterly, and yearly durations. Premium package, on the other hand, has all the top features that Xnspy stands for. You can start using this package by paying as low as $12.49 per month for an annual package. You would be disappointed if you are looking for a free trial period here, but Xnspy makes up for it by offering a hands-on demo on its website. One package is applicable to one device only. Xnspy is a comprehensive mobile spying app that packs all the right features for basic as well as advanced level monitoring. The disparity between the basic and premium subscriptions is outrageous but if looked at the bright side of this, you get double the features just for a fraction of incremental cost involved with Xnspy’s premium edition. Xnspy is affordable and there’s no doubting that. But what makes it truly valuable is how good of a monitoring it is. All the features are spot-on; the app is super discrete, so nothing really to worry about getting your truth out in front of everyone. If you want a spy app, there’s definitely no better solution available for now.